Propranolol is a non-selective beta blocker that lowers blood pressure, slows down the heart rate and reduces the heart's need for oxygen. This allows the heart to pump with less effort, which reduces the chance of serious cardiovascular disorders such as myocardial infarction (heart attack) or stroke. Myocardial infarction (to prevent future heart attacks). Propranolol is also used in the treatment of, for example, migraine, essential tremor (tremor without underlying cause) and anxiety (pre-exam nerves or stage fright). Propranolol tablets should be taken at the same time each day with water and can be taken with or without food. 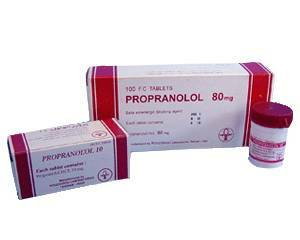 Propranolol is also available as SR tablets (sustained release) and as oral solution. Use the provided dosing syringe to measure your oral solution dose. To prevent cardiac complaints, treatment with this medicine should be stopped gradually, following the instructions given by your doctor. For angina pectoris: 40 mg, two to three times a day. For other conditions and use in children the appropriate dosage regimen is determined by a doctor. Always follow the prescribed dosage and read the package leaflet closely before use. Most side effects are only temporary. See the package leaflet for a complete list of possible side effects. people with certain heart conditions, lung disorders (asthma), metabolic acidosis (increased acidity in the blood) or other serious illnesses. Propranolol interacts with other medicines, including blood sugar reducing medication, migraine medication and certain anti-inflammatories. Therefore, it is important to tell the doctor what medicines you are currently taking. See the package leaflet for a complete list of contraindications, interactions and warnings. Propranolol should not be used without consulting a doctor first if you are pregnant or breastfeeding. This medicine should be gradually discontinued in the last months of pregnancy to prevent health problems for the unborn child. This medicine may affect your ability to react. Stay out of traffic if you feel drowsy, sleepy or dizzy. Drinking alcohol intensifies side effects such as dizziness. You should therefore limit or avoid drinking alcohol altogether while taking this medicine.